OCT 1 2018 UPDATE: See our 2018 updated version of this article HERE. 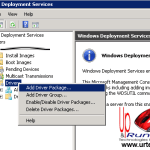 Unpacked drivers means that your driver files must be extracted from their .EXE or .MSI or .ZIP file. In the DRIVER GROUPS window, make sure you choose, SELECT AN EXISTING DRIVER GROUP. If you add a filter, the drivers will only be applied to devices that meet that filter… I want Windows to figure out if it is needed or not. I have confirmed that after these steps are complete, the drivers are sucked into WDS and you original source files can be deleted. However, as far as I know there is no easy way to migrate these drivers to a new server (should you upgrade in the future) so I would keep them around and use a naming convention that makes sense to you (like DELL-VIDEO-LAT6440) so that you can re-add them to a new server in the future.